Create a new (Ctrl + N) document 1200 x 1120 pixels with any colored background, double click the background layer to unlock it and make it editable. Now add a gradient overlay to the background layer using the settings below. Select either the “Pen Tool” (P) or the “Ellipse Tool” (U) then create a curved selection like the image below. Once the selection has been created select the “Gradient Tool” (G) with a foreground to transparent gradient type. Drag the gradient over the bottom right side of the selection. Once you have something like the image above set the layout opacity to 15% then add a drop shadow using the settings below. Duplicate the shape 2 times then rotate and re-position using the “Free Transform Tool” (Ctrl + T). In the top left corner of the layout add the website title and slogan, separate the title from the slogan by adding a divider in between. In the top right corner add a snapshot of yourself or an avatar of some kind, once you’ve added your desired avatar add a white round rectangle around it using the “Rounded Rectangle Tool” (U). Select the “Rectangle Tool” (U) then create a 3 rows of boxes, one or two of the boxes can be split into two smaller ones to keep with the windows 8 style UI. Once all the boxes have been created and are all aligned up, go through each box and add a gradient overlay using your desired colors, each box should preferably have its own color. The top 3 boxes on this layout are going to be my welcome box, recent work and blog. In the welcome box just add a nice big title with some dummy text, use one of the icons from the Iconic Icon Pack to go next to the heading. For the blog box we need to cram inside the date of our recent post, title and description. I started with a pretty big date on the left, on the right i add the post title and description. The two were then separated using a simple fading divider. Continue to build up the content within the boxes, try and mix in some images also to brighten the whole area up. Once your finished you should have something like this. Underneath the windows 8 UI style part of the website i think we should add in some normal flowing content. Simply add some text on the left side with a nice big heading. Underneath the paragraph of text throw in a small list for good measure. On the right side of the text add a simple gallery using some of your best pieces of work. Duplicate the header background pattern shapes then flip them vertically “Edit > Transform > Flip Vertical” and place them at the bottom of the canvas leaving them to overlap behind the content. Where the content ends add a dividing line using two 1 pixel lines on top of each other. Once the lines have been created add a layer mask to the layer and drag a reflective gradient from the middle outwards. Finally select the “Type Tool” (T) and add your copyright information. Its amazing :) .. But you forget to put the dimensions of the 3 rows of boxes .. and the font that you used in the logo .. anyway THANKS for this amazing design. Thanks for the tutorial great inspiration. Awesome tut my friend tought me a few tricks i dint know. (not giving up my XP though). Nice tutorial! Love the layout. 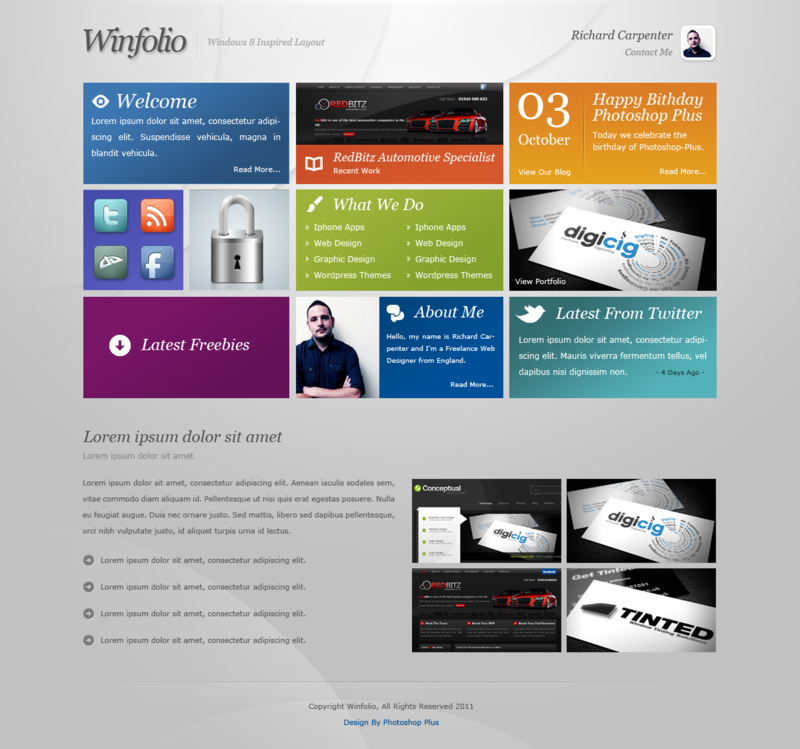 This would be cool as a WordPress theme. I am am always looking for new techniques to use and I love the simplicity of the background and the feel you have created through the layout and use of colour. I am finding through reading articles like this one that some of the best backgrounds are created using the simplest of techniques and the techniques you have used in this tutorial will be book marked as a resource for myself in the future. I also really like the contrasting use of colour in the boxes and how they stand out from the page. Overall I think this is a great tutorial and one I can learn a lot from. I look forward to more tutorials from yourself. Thanks @Paul, its comments like yours that keep me going. Nice tutorial, my lines in the background didn’t turn out as well as yours, but picked up some valuable new skills from this. Which font have you used inside your Tiles for the text, just Arial? Nice tutorial! Love the layout.